main features : all-new design, new V8 engine with larger capacity (5.7L) and high output (381 HP) , towing capacity of 8500 pounds, permenant four-wheel drive, 20-inch rims, hidden cameras, 19 speaker Mark Levinson Audio System (optional), hard disk drive for storing songs, nine-inch screen (for the rear seats) , parking assistance, adaptive cruise control, navigation, bluetooth, XM satellite radio, standard 10 airbags and many more features. 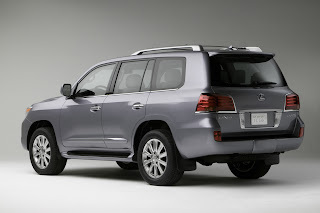 notice that the front looks like the new LS and the rear looks like the Lincoln Navigator, and since this is the new LX then the new Land Cruiser will look pretty much the same.. what do you think?? to read more about this car and see 66 official pics then click here. these are the official pics and you can read the full press release by clicking on the link, and when you do so, read what people have been saying about it, many people think it got uglier, fatter and disappointing. the only good thing about it is the power (380hp). 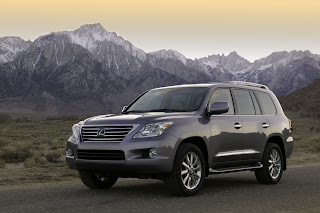 my advice: stick with older models of LandCruiser and LX470. You know what bo 9agr, I'm actually looking for a new SUV. For9a 7elwa elly azoor feha your blog. glad to see you here Mishari. first of all, why the hell do you call yourself "Expatriate"??? and secondly, after all these years in the US, now you want to buy a Gas-Guzzling SUV? haven't you read anything about Global Warming? it's nice to see u here bro, and thanx for passing by..